When documenting code libraries it is important that namespaces are described. XML documentation comments do not support the addition of summary information for namespaces. However, this extra information can be added using Sandcastle Help File Builder. SHFB gets around the limitation by allowing you to manually add a summary to each namespace. This summary is stored within the SHFB project so that you do not need to recreate it each time you build the documentation. When the dialog box first loads you must wait for a few moments whilst your project is reflected over and the contained namespaces identified. 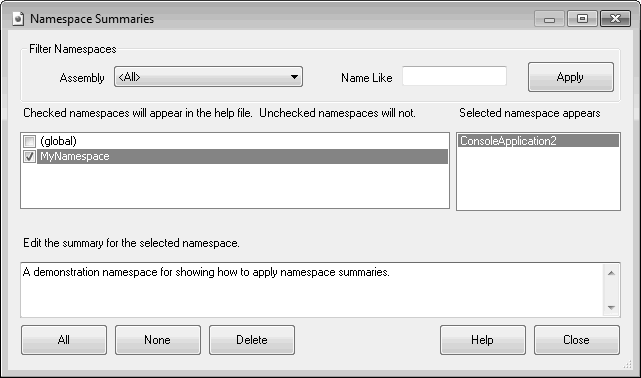 Once this process is complete, a list of discovered namespaces is displayed in the list at the left of the dialog box. Click one of these and the assembly name is shown in the box to the right and the current summary for the selection is displayed in the textbox at the bottom of the dialog box. This summary is blank until first provided. Add the summary for each namespace that requires one and click the Close button to complete the process. You should save the SHFB project to retain the descriptions. Once the dialog box is closed, simply rebuild the help file project. After compilation, you will find that the namespace summary information is present in the generated help file.